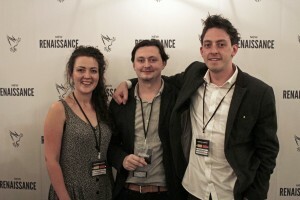 The New Renaissance Film festival loved ‘Paris in the Rain’ for its wit, originality and skillful storytelling. A remarkable debut by Writer / Director Eli Hart, and great potential in the filmmaking partnership with brother Zachary! 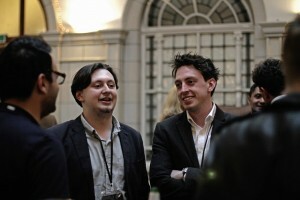 Eli graduated from the London Film Academy where he wrote several short films, one of which won the audience award for ‘Best Film’ at the BFI. 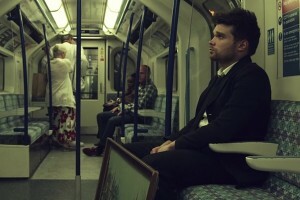 He has since been hired as a writer by London based production company Racine Media, and works as a Director at EC1 Studios in Angel. Alongside filmmaking, Eli is an accomplished songwriter and film composer. During his ten year stint in the rock band, ’Fans of Faye’, he recorded and released a studio album which reached number 24 in the iTunes charts. Hailing from just outside Wolverhampton, Eli uses film to bottle his tragic and darkly funny view of the world. He is currently finalising the script to his first feature film. 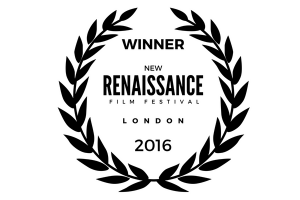 Hello Eli, congratulations on winning BEST UK DIRECTOR at the recent New Renaissance Film Festival held in London. How does it feel? It’s always a great feeling when people like the movies you make. You spend your whole time wanting people to like it and when they do, you don’t quite believe them. 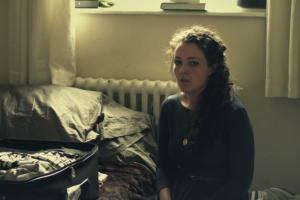 What was your inspiration for this short film? 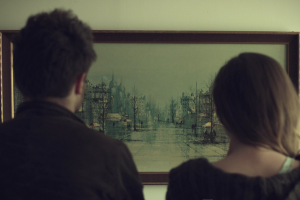 My Grandfather had passed away, and my family was left with a lifetime of trinkets and odd possessions – one of which was the painting you see in the film. It had been on his wall for fifty years, and I had always loved it as a kid, so when it came time to remove things from his house, I couldn’t bring myself to see it get thrown out. I took it and travelled from my hometown in the midlands to my flat in London, the painting underarm. The idea for the film came from that journey. The work of Edward Hopper was also a massive reference point for me. His paintings astound me. Is there a scene in the film that you found challenging to shoot? Probably the living room scene with the twelve or so guests. It took us a while to balance the placement of everyone in the frame in a certain way so that the congregation opened up to camera but at the same time, didn’t look staged. Also, they were all non-acting family members, who were more bothered about the elaborate spread of food and the fact they were attending a wake where no one had actually died. What would you have done differently on this film? I try not to think in that way. You could drive yourself crazy with what you could have done to make it a better, but for me, there’s a point where you’ve got to say “This is the film now. I will tamper with it no more”. 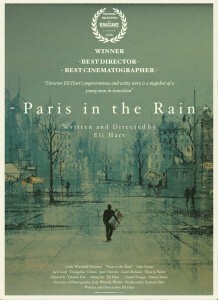 As the director, did you learn anything new from making Paris In The Rain? The notion that life is going to seep into your film and ruin it. And that’s ok. There’s things in Paris that I did not want, because of the size of a room, or the little amount of time we had to shoot, but what you end up getting is something that’s more real and more interesting than anything you could’ve planned. It has life because it has flaws. Absolutely, and I was stubborn about it too: there was a questionnaire at school, with three boxes where I was told to write my first, second and third choice of profession. I wrote ‘Film Director’ in all three. Was there a film that inspired your ambition? What’s weird is that, although I can think of movies that have definitely been a game-changer for me (Early mornings in front of TCM with my father, watching old Kurosawa Movies, as well as anything by Alexander Payne etc), there’s moments that I’ve actually seen things in real life that have made me think “I have to try and bottle this”. When I was younger me and my Dad were driving into Cardiff city the once and to my left through the torrential rain in an old beat up fiesta, there was a beautiful young woman sobbing at the wheel. completely sobbing, phone in hand with the windscreen wipers going like crazy. I never found out who she was or why she was crying, but the image of that will stay in my head forever. I remember thinking then and there “How do I bottle this?”, and somewhere down the line I’ve fallen in love with film as a vehicle to try and do so. 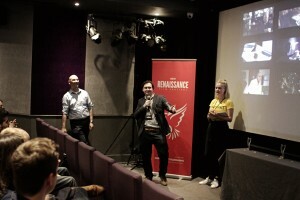 What is the hardest thing about being a director and directing a comedy? For me, it’s hard to finally put the work down and say ‘enough’. Handing it over to an audience is the best way of concretely making sure you don’t ever try and tinker with it again. I also have this thing where I don’t refer to my movie as a comedy until it makes people laugh. Find out what you want to ‘bottle’. I am prepping my new short, which is going to be shot in December. I feel like if I could articulate that in a sentence, I wouldn’t have had to make the film, but to be honest, there probably isn’t a significant part of the process that considers the audience or calculates and end message to be extracted. I make films for me, as a form of therapy almost.